As a unifying premise for an examination of artistic journeys not confined or restrained to a psychical or physical space, Solnit’s concept of footsteps as meditation and walking as an enlightened collaboration between self and nature provides a neat curatorial framework to explore how artists have engaged with making work off the beaten track. But it also suggests a kind of spiritual linearity, an inevitable progression to an idealised destination that potentially undermines a more liberated sense of what art without walls—without boundaries—might mean, both then and now. Featuring over 40 artists and collectives spread across two locations in Buffalo—North Campus’ art gallery and Anderson Gallery—the exhibition crosses dominant narratives with lesser-known tracks, under the imaginative curation of Rachel Adams of UB Art Galleries. Navigation is non-chronological, poetic and loosely associative, through a considerate interweaving of historic artworks with more recent projects and newly commissioned off-site works. Unsurprisingly, the exhibition is firmly rooted in the artistic practice of the 60s and 70s, signposting pivotal, or seminal (pun entirely intended), moments in the developments of Conceptual, Land, Process, and Performance art. Canonic milestones such as Richard Long’s ‘A Line Made by Walking’ , Michelangelo Pistoletto’s ‘Walking Sculpture’ (both 1967) and Vito Acconci’s ‘Following Piece’ (1969) are all duly included. Allan Kaprow. 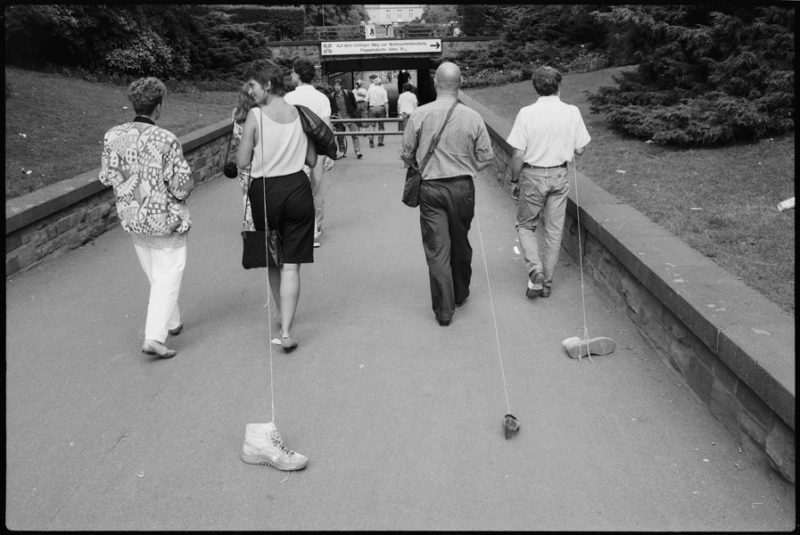 Taking a Shoe for a Walk, 1989. Activity. Photo: Wolfgang Traeger. Courtesy Wolfgang Traeger. Copyright / All Rights Reserved by Wolfgang Traeger, Germany. The route becomes more interesting when it drifts away from an intellectual and romanticised—straight, vertical and inevitably advantaged—trajectory to consider more pluralised, wayward and meandering footpaths that question, challenge and complicate the outdoor space. The title of Francis Alÿs’s public performance ‘Sometimes Doing Something Leads to Nothing’ (1997) lends the action of pushing a rectangular block of ice through the streets of Mexico City until it completely melted a wry humour, and equates the artistic effort with futility, whilst alluding to larger urban-ecological concerns. Pointlessness is also employed in the collective Blue Republic’s persistently ephemeral (and private) actions of their site-specific land art or ‘water graffiti’ on the hot rocky shores of Lake Huron in Canada, which inevitably disappear with the heat, and time (‘Water Drawings’, 2016). 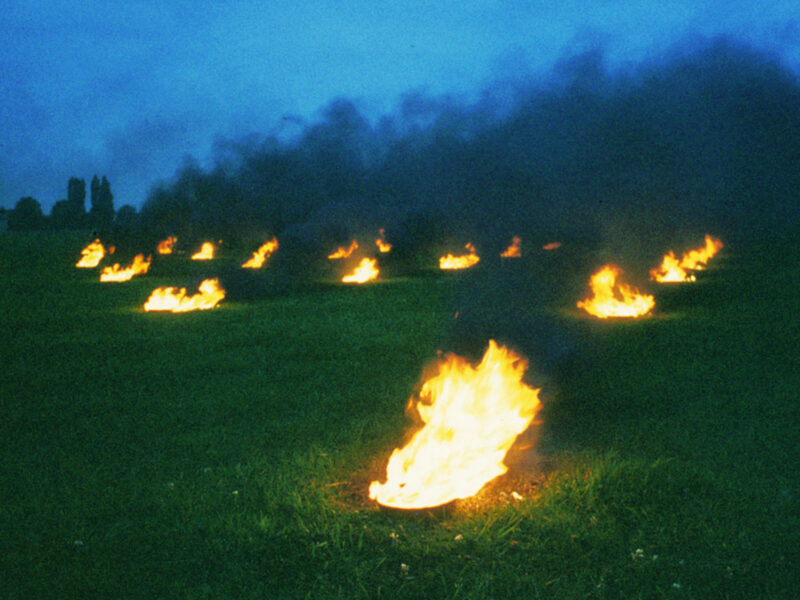 The issues rendered in these works—clearcutting of forests, 9/11, the corporate ladder—refer to globalised capitalism or terrorism, whilst their very transient and ethereal nature advocates a resistance and deceleration toward today’s presentism. Teresa Murak. Procession, 1974. Color photograph on glossy paper. 11 3⁄4 x 11 3⁄4 inches. Courtesy of the artist and Broadway 1602 Harlem. The hierarchies of (mainly Western) heroicised land art and the white-male dominance of late modernist conceptual practices are importantly rebalanced through the inclusion and repossession of underrepresented feminist and non-white artists. 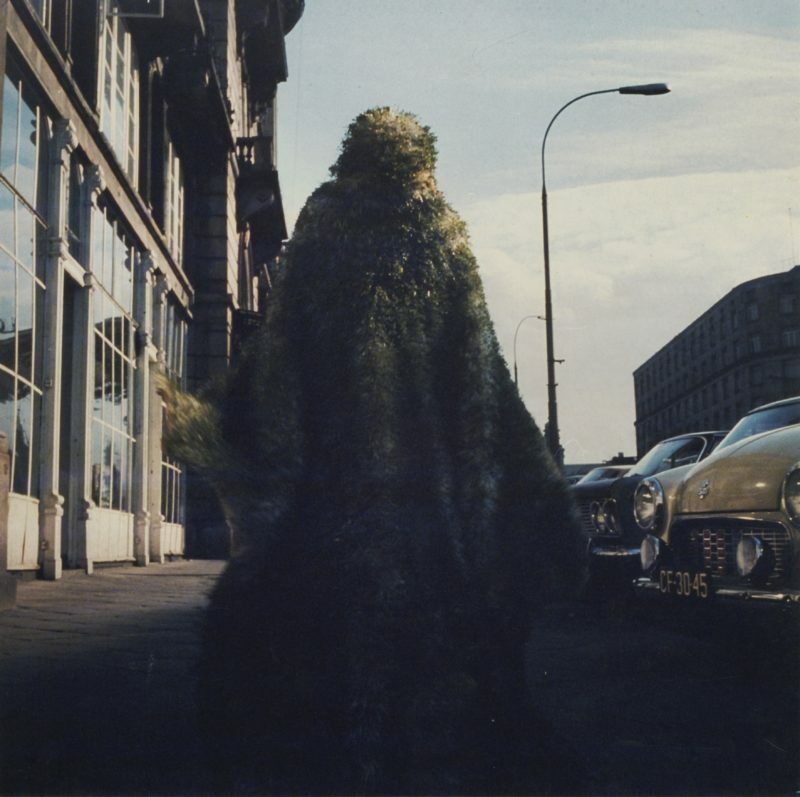 In Teresa Murak’s ‘Procession’ (1974), the pioneer of Polish eco-feminist art wanders the streets of Warsaw wearing a coat sprouting a native wild-flower (Lady’s Smock), asserting fertile presence in a masculinised public space. The solitary performances of Cuban-American artist Ana Mendieta are represented by a display of twelve photographs documenting her site-specific earth-body work ‘Silueta’ (1977), made in Mexico. The artist’s body was imprinted in land, and marked in remote environments with rocks, fire, pigment and blood, paying homage to a universal, feminised earth goddess, and pagan ritualistic practices at odds with the rational governance of patriarchal narratives. 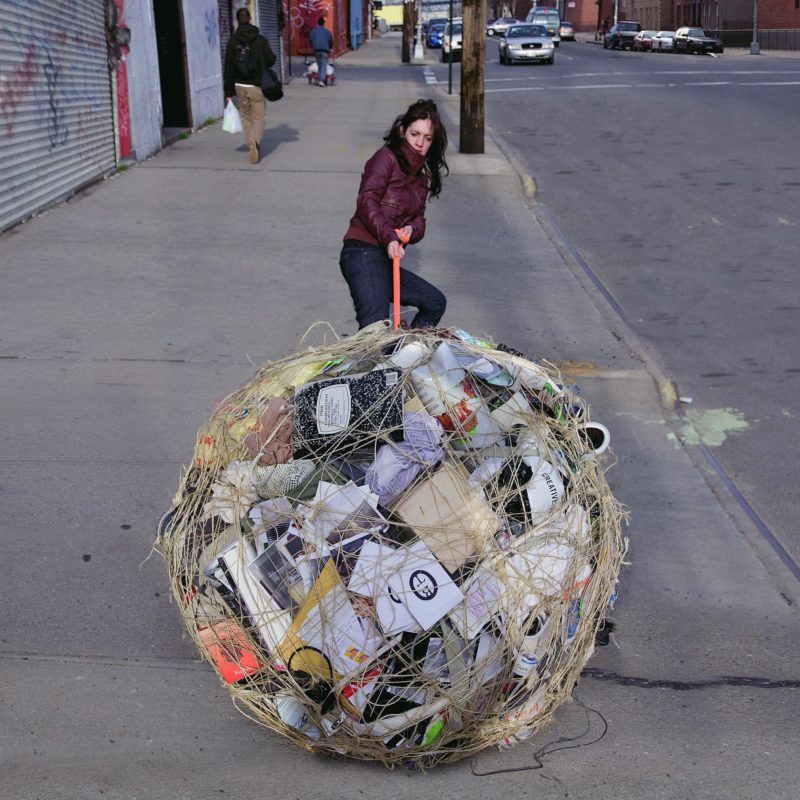 In a more urban environment, the US artist Rosemarie Castoro is shown wrestling with a large roll of aluminum sheet metal as she moves along a downtown Manhattan street (‘Gates of Troy’, 1969). This intellectually rigorous and formally advanced work ranks her amongst the best-known of her Minimalist and Conceptual peers, whilst remaining vastly under-recognised. An inherent human desire for wandering and exploration is interwoven with issues of race and belonging in Pope.L’s arresting endurance performance ‘The Great White Way, 22 miles, 9 years, 1 Street (Whitney Version #2)’ (2001). One of the strongest works in the exhibition, it shows video documentation—on a TV-monitor resting on a pool of dried black resin—of a black man dressed in a cape-less Superman costume crawling the length of New York’s Broadway on his hands and knees. His embodiment of this position, traditionally identified as abject, has profound resonance and urgency with contemporary issues, particularly the Black Lives Matter movement and the rise of the white supremacist, neo-fascist tendencies in the US and Europe. Similar themes of violence, politics and representation are present in Wangechi Mutu’s single-channel video projection ‘Cutting’ (2004), in which the artists hacks a jagged log with a machete producing metallic, strident sound, bringing our attention to the genocides of Rwanda and Sierra Leone. 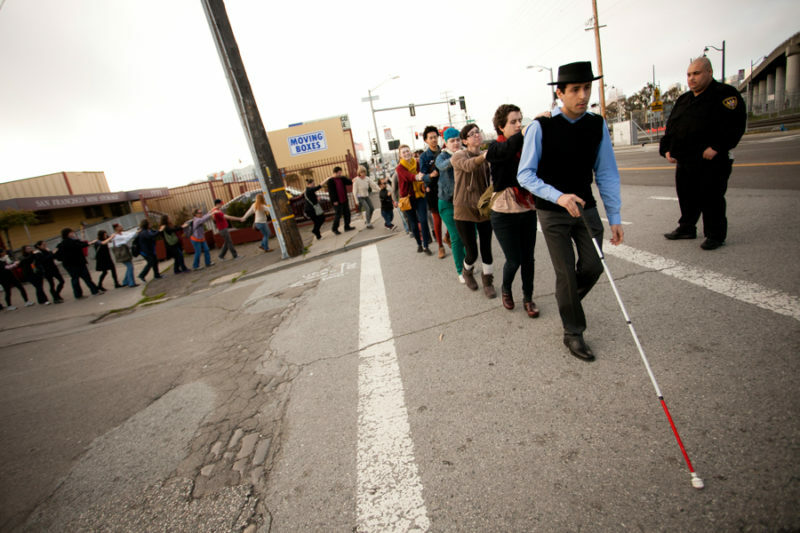 According to Michel de Certeau, walking ‘enunciates’ spaces, and, as such, can be a creative, resistive, antithetic and critical everyday practice, common and—a slight ableist oversight here— available to everyone. In the current climate of mass migration, border controls, and refugee plight, where it is no longer possible to move freely without restriction, the question becomes: is wanderlust little more than a literary device, without relevance or possibility? Is it desirable—or even feasible—to wander off, disappear without a trace, in a world under constant surveillance? Perhaps the underlying and poignant message in Wanderlust is not about walking with a purpose, but about getting lost. The exhibition is at its best when it cruises new and important territory, the less travelled, underrepresented and subversive geographies; wanderlust is revealed not only as an aesthetic and conceptual strategy, but a cultural and political activity that spans issues of race, representation, globalisation, conflict, and the environment. And, as such, shows the worth of straying from—or refusing—the beaten track.